More than 300 drivers coming from 40 Countries enlivened the weekend of the Lonato’s historical race at the South Garda Karting di Lonato. Among them, also our Kosmic Racing Department’s drivers. The Winter Cup is among the most historic and attended competitions of the international calendar. This was also confirmed with the 23rd edition of the race, which gave spectacle and some difficulties due to the heats on wet asphalt and a rather cold weather. In OKJ our young drivers Rafael Camara and David Hadrien alternate in the top ten (or just beyond) during Super Heat 1 and 2. In the final Hadrien is the best between them: ends 15th and shows all the virtue of the Kosmic-Vortex material with an excellent comeback that allows him to recover not less than 13 positions. Different fate for Roman Stanek, great protagonist in the qualifying heats (4th overall) and in the heats (he got a 2nd, a 3rd and a 4th place), 5th in the Super Heat 2, but slipped in the Final at the 18th place. Viktor Gustafsson also qualified for the final. 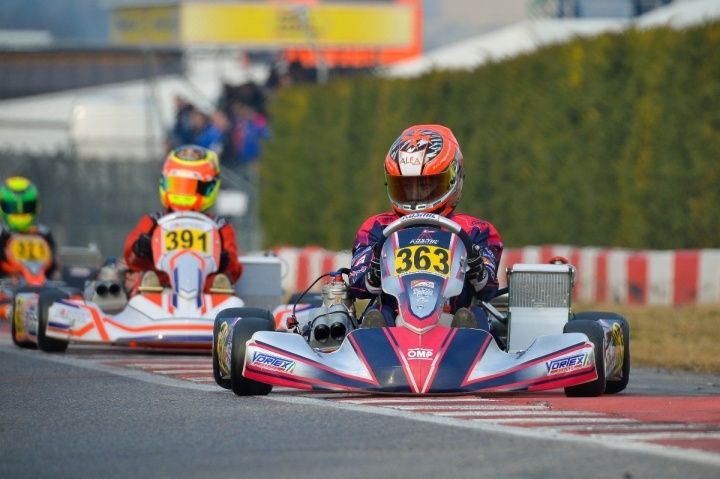 Finally, the KZ2 drivers Oliver Rasmussen and Axel Bengtsson find some difficulties, but still accumulate a lot of experience that will be useful in view of the next competitive engagement: Round 2nd of the WSK Super Master Series, still scheduled at the South Garda Karting in Lonato from 2nd to 4th March.